One might wonder why I chose to pickle carrots when cukes are at their peak season right now. That’s a fair question. Back in March, I attended a canning & preserving workshop facilitated by the Everdale Organic Farm and the Toronto Green Community. Discussing the workshop with a friend, she told me she had fond memories of her aunt pickling every summer and making a jar of pickled carrots especially for her. To practice my new skills, she happily agreed to play guinea pig for my first canning project. And sadly, I just got around to doing it a couple of weeks ago. Rest assured that cukes are next! Preheat oven at 225 F. Bring your water-filled canner (or large, deep pot) to a simmer (I use a deep pot in which I placed a homemade rack – see below). Place your empty jars without lids in hot water. In separate, medium-sized pot, place the lids in hot, but not boiling water. To make the brine, combine the water, vinegar and pickling salt in another pot and bring to a boil. Keep hot until needed. Remove the jars from the canner (you can use new plastic rubber gloves or jar lifter), and place into the preheated oven to be filled one by one. Bring the water in canner to a boil. One at a time, take a jar from the oven and place 1 tsp of dill and 1 garlic clove in it. Fill tightly with carrot sticks. Using the funnel, cover with hot brine leaving 1/2 inch of head space. Repeat with all jars. With the help of the magnetic stick, place lids on jars. Screw bands onto jars, but only fingertip tight. Place all jars back in the pot of boiling water for 10 minutes. You should be able to see the air bubbles come out of the jars. After 10 minutes, remove the jars from the canner and let stand. You should hear the lids “pop” as they seal. Double check the lids after 24 hours and refrigerate any that has not sealed properly, to be eaten first. Wait a couple of weeks for the flavours to develop, et voilà! Enjoy within a year. 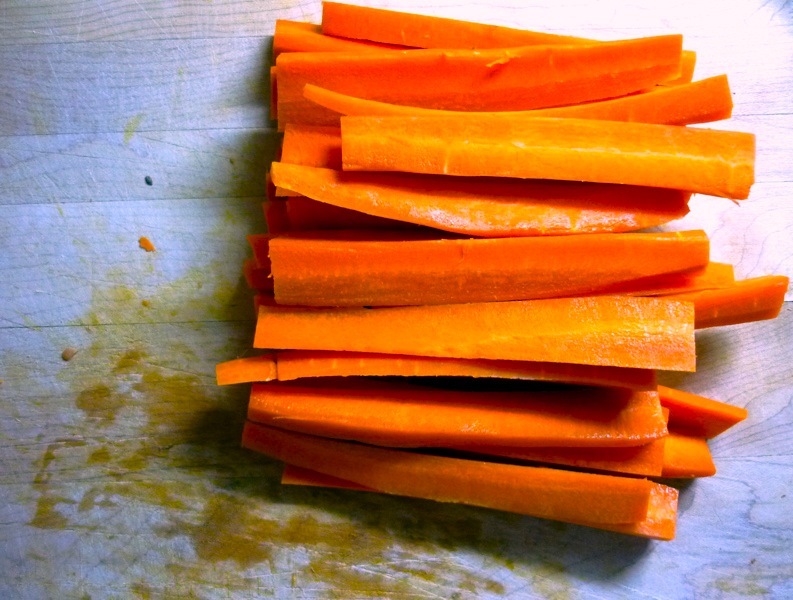 I'm excited about pickling carrots and plan to try this recipe this weekend. Were you satisfied with the results? I did them and they are the best. Yes, they turned out nice. The carrots remained crispy yet absorbed the flavours of the dill and the vinegar. Delicious! Hello! Just stopping by again to say that these were a *huge* hit and they turned out great. I was a bit low on dill seed when I made these so I tried a variation in a couple of the jars by adding a couple of cardommom pods and a half a serrano chili. Gave them a good kick! You are making me actually want to dig up my sad little carrot patch. Go you! I can hardly wait to get my jars and canning stuff out. Thank for the recipe!! I won't be able to pickle for a while yet but for a first timer it is very helpful. Yes I assume you could use fresh dill though I have not tried myself. You would most likely need a lot more than the seed amount to get a similar taste. Would I need to process longer at my elevation of 6200? Good question! Yes, you should add 15 minutes processing time. Your pictures are stunning! They really outline an aesthetically pleasing view of canning and how colorful and inviting the process can be. The pictures alone do a great job of making me want to try the recipe! I’m going to have to give it a shot and report back with how they turn out! Thanks so much for sharing! You can jar them raw which is what I did here. They will remain quite crunchy. I haven’t tested with blanching them first but would be concerned that they might end up a little too soft once the jars are boiled / processed and you let it rest before eating. Love your photos! Could I use pickle crisp in this recipe? I’m new to canning. Any experience with pickle crisp? Is it affecting the nutritional balance at all? I have yet to do research on it. Thank you! Unfortunately I have no experience with pickle crisp so I can’t advise on that. Years ago I made a sweet pickled carrot that contained mustard seed, white vinegar and sugar. I lost the recipe and have never found one similar to it. Do you or your readers have a recipe for sweet pickled carrots. Thank you. Please send reply via email. I’m pretty sure you could just use carrots instead of cucumbers. Good luck!